Lily of the valley is one of the landscape's toughest plants, capable of withstanding challenges that would kill more timid ground covers. It blooms in the spring and early summer—usually May. The stems are covered with tiny white, nodding bell-shaped flowers that have a sweet perfume. Green berries may succeed the blossoms, later ripening to red or orange. The plant does, however, have its drawbacks, as it is toxic to animals and humans and has the reputation for being an invasive species. Not a true lily, it is botanically called Convallaria majalis, which means "May valley" and it is part of the asparagus family. Lilies are so widely adored that the name has been loosely applied to many other plants, creating confusion for beginning gardeners. Sun Exposure: Partial shade is optimal. It will also grow in full shade, but may not produce as many flowers. Native mostly to Eurasia, lily of the valley plants can be grown in planting zones 2 to 9. This puts them among the hardiest of perennials. When you buy some to plant them in your yard, they usually come as bulbous roots called "pips." Plant them in a mostly shaded to partially shaded area (morning sun only). Grow them in well-drained, loamy soil for best results, although the plants do tolerate clay soil better than many. Amend the soil with compost. Lily of the valley flowers prefer moist, cool conditions. The shade requirement needs to be taken more seriously the further south you get in their range. The plants will generally survive in the North from whatever rainfall you receive, but you will get better flowering if you give them water during dry periods. To be enjoyed to their fullest, the plants should be massed together (the flowers being small). The plant is also used in rock gardens and moon gardens, for cut flowers and weddings, and in medicines and perfumes. Another nice thing about this ground cover is that it is deer-tolerant, rabbit-tolerant, and likes growing under trees. The plant grows well in part shade to full shade, as well as sun-dappled shade. It is easily grown in moist, fertile, organically rich, well-drained soils and tolerates a wide range of soil conditions, including dry and clay soils. Mulch to maintain soil moisture throughout the summer. Because these plants prefer rich soil, apply compost each fall. Water the lily of the valley when the top 1 to 2 inches of soil becomes dry. Avoid wetting the plants' foliage if possible. Water during morning hours so if foliage gets wet it has time to dry before nightfall. Do not allow the soil to become overly saturated. The plant thrives in cool to average temperatures from 60 to 70 degrees Fahrenheit. Lilies of the valley are cold-hardy to USDA Zone 2 if you plan to plant them outdoors. They naturally bloom in late spring. Fertilize lily of the valley with balanced 10-10-10, slow-release, granular fertilizer every three months during the active growing season. Despite their delicate appearance, sweet-smelling lily of the valley is a tough little plant that can easily be divided and transplanted. Sprigs propagated in September and October reward you with eager regrowth the following spring and the sweetest smelling blooms in your garden in May. As an invasive plant species, it can easily double its numbers each year. The plants spread via underground stolons and rhizomes. Divide each lily of the valley plant every 2 to 4 years, or when the plant becomes crowded or outgrows its landscape area. When transplanting, create divisions that each contains a healthy rhizome and stems. Replant the divisions at the plant's previous growing depth, spacing individual divisions 24 inches apart. This plant establishes a colony. And once it does, it is difficult to eradicate it. If you try digging it out, the smallest root left behind will produce more plants. One option, after digging out everything that you can, is to cover the affected area with a tarp for a year or so. Afterward, remove any stubborn holdovers that surface. These are poisonous plants, which is a concern if you have children or pets in the yard. Experts advise wearing gloves when handling them so that any residue you pick up is not transmitted to your food (should you forget to wash your hands before dining). All parts of the plant are considered poisonous if eaten. Symptoms of poisoning include stomach ache and blurred vision. C. majalis var. rosea bears rosy pink flowers. C. majalis 'Fortin's Giant' has larger flowers than the typical lily of the valley. C. majalis 'Flore Pleno' is valued for its double flowers. C. majalis 'Hardwick Hall' is a variegated plant chartreuse leaf margins. C. majalis 'Albomarginata' is variegated with white leaf margins. C. majalis 'Albostriata' has white streaks throughout the leaves. Lovers of native plants in eastern North America may wish to substitute C. majalis with wild lily of the valley, also known as "Canada mayflower" (Maianthemum canadense), another member of the asparagus family. 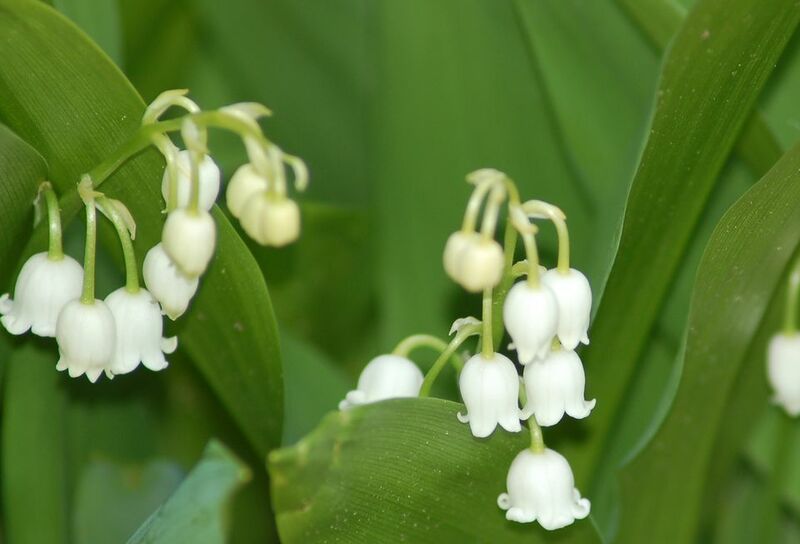 Lily of the valley has no serious insect or disease problems, but be on the lookout for aphids and spider mites. At the first sighting of such pests, spray with organic neem oil. Stem rot, leaf spot, leaf blotch and anthracnose may appear but usually are not fatal. Hot summers will cause the foliage to decline, but the plants rebound in the fall or following spring.